Should I warn you when a post is the mommy blog kind? This might be one. The clothes picture is because I want to brag about my husband. He went to Goodwill and got kids clothes! Say whuuut? Right? The jeans are totally cute and and and they are Levi's. I'm sort of super proud. I think he spent $7. Also, I basically look and feel like a cow. The crazy awful pain in my left groin ligament area is enough to make me wanna fist pump a Jersey Shore character in the face, which is saying something. Because that show is awesome. Lol. Speaking of animals, we got rid of our beloved Silver today. We had her for a total of 2.5 months. 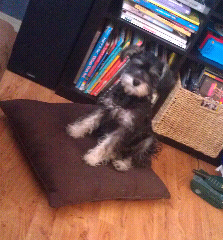 She was our miniature schnauzer. Unfortunately, it was her time to go. No we didn't kill her you ruthless heartless humans. We gave her away. I won't lie and say that I didn't want to do that sometimes but I'm pretty sure they would revoke my PETA membership. Jackson only teared up for a second. And me? For like an hour. Only because he started it. It wasn't even cause I was sad to see her go, its because seeing my little 4 year old cry over her made me die inside a little. I hope he isn't traumatized for life. I really don't want to be THAT mom. Also, the time has come for me to turn off my 7:00 a.m. alarm set for Thursdays. That's right folks, I don't have to work tomorrow. Or for awhile. My maternity leave starts now. But lucky for you I have lots of trashy stories saved up. You just wait.